Psalm 107:8 says: Praise the Lord for His goodness, and for his wonderful works to the children of men. Here are 20 ways to praise the Lord with your kids. Why is it that “children and complaining” are attracted to each other like a “moth to a flame?” If you have kids running around your home or school, you know this to be true. As parents and teachers, we are constantly fighting the battles of ingratitude and complaining lips. What is the remedy? I think Psalm 107:8 has at least part of the cure. It says: Praise the Lord for His goodness, and for his wonderful works to the children of men. God is ALWAYS good! And there are an infinite number of reasons we can praise Him for His goodness. If we can s be an example to our children of praising God for His goodness, then I believe God will bless us our families and schoolrooms with His peace and give us grateful hearts. But what are some of the ways we can praise the Lord for His goodness? More specifically, how can we encourage our children to praise the Lord for His goodness in relationship to the elements of their lives? Here is a list of 20 ways to praise the Lord for His goodness to get the ball rolling in your homes and classrooms. In the morning, praise the Lord for a good night’s sleep. In the morning, praise the Lord for your healthy teeth you get to brush. In the morning, praise the Lord for the clothes and shoes you have to wear. In the morning, praise the Lord for the breakfast you get to eat. In the morning, praise the Lord for the school you get to go to. In the morning, praise the Lord for your family and thank God that He will be with each one of them throughout their day. In the morning, praise the Lord for the ability to work hard at your schoolwork. In the afternoon, praise the Lord for the lunch you get to eat. In the afternoon, praise the Lord for all the friends you have sitting around you. In the afternoon, praise the Lord for the opportunity to play. In the afternoon, praise the Lord for the sun up in the sky and the trees all around. In the afternoon, praise the Lord for the chores you have to do at home to help keep your home safe and clean. In the afternoon, praise the Lord for those who watch over you and keep you safe like grandma or your uncle or a baby sitter. In the evening, praise the Lord as you welcome each family member back home. In the evening, praise the Lord for your dinner. In the evening, praise the Lord for any homework you have because you know it is making you smarter. In the evening, praise the Lord for all the good things He did for you today. In the evening, praise the Lord for the moon and stars. In the evening, praise the Lord for a bed on which to sleep. In the evening, praise the Lord for the day that HE made and that He gave for you to enjoy. This is a small list of ways to praise the Lord for His goodness. Maybe you can encourage you children to think of other ways to praise the Lord. He is worthy of ALL our praise! Would you like a LOT of Bible Verse Songs to help teach your kids about God’s goodness? Then check out The Scripture Lady’s “75 Downloadable Bible Verse Songs Package” for ONLY $9.95! If you liked this creative Bible idea, then sign up to receive Scripture Lady’s Free Email Kid Tips packed full with creative ideas and receive 12 FREE Bible downloadable resources to help get the kids you minister to excited about the Bible! Just go to www.MyFreeBibleGames.com to fully subscribe. 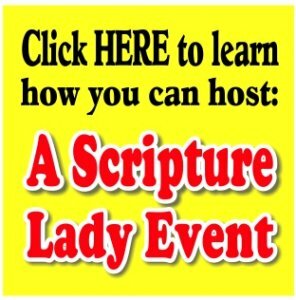 Where Is The Scripture Lady Performing in January 2018?